It's common knowledge that New York City is dominated by islands. However, very few people explore the city outside the borough of Manhattan. Even fewer would venture onto Roosevelt Island, which by the way is not the Teddy Roosevelt Island but is named after Franklin D. Roosevelt Instead. In any case, this dearth of traffic doesn't mean that the island isn't worthing visiting or doesn't have much of a history - quite the opposite. Though the island now serves mostly as a sprawling city park, the island itself has had a storied past, one that is inextricably linked with some of the city's less desirable talking points. From the Octagon to the Roosevelt Island Smallpox Hospital, Roosevelt Island was once the island where New York's mentally sick went to seeking rehabilitation and help. However, that's only half of the island's history. These days, it is an oasis of calm from the bustle of New York City. Sitting along side those 'institutions', the FDR Four Freedoms Park and the Cornell Tech city campus are ambitious experiments in creating spaces for proper learning, recreation, and relaxation. Hence, Roosevelt Island really is the perfect staging ground where the old literally faces the new - a curious part of the city that's peculiar even for locals. The island has played host to many hospitals, but none have been more prominent in New York's psyche than the Roosevelt Island Smallpox Hospital. What is smallpox you ask? Just about one of the deadliest diseases ever known to mankind. Also known as the Renwick Smallpox Hospital, named after its architect James Renwick, the hospital served as a quarantine facility for immigrants entering the city during the height of the global smallpox contagion. After the disease was eradicated, the gothic structure got incorporated into other hospitals before finally being decommissioned in 1950. In its current state, the hospital joins a long register of historic yet 'abandoned places in NYC'. Signs point out that the structure is currently unstable, and the ruins may collapse if there is further human activity at the site. Nevertheless, plans are in place for the structure to be stabilised and thereafter reopened to the public. Yet another building dating back to the island's grisly past is named the Octagon which due to its age, also unsurprisingly shares the gritty reputation of Renwick's hospital. Back in 1834, the Octagon was conceived as an asylum built for the insane in order to pioneer new methods of treating mental issues. The building itself was beautiful and designed very much like a chapel rather than an asylum, which is perhaps aligned to the mission of its founders. This is also probably why it is now part of a modern apartment complex. Sadly, the history of the institution's early years betrays this bold architectural vision. Unlike its bold vision, the Octagon started with chronic underfunding and overcrowding, leading to multiple instances of diseases afflicting patients. It's certainly not what would have helped patients overcome their challenges. This environment is perhaps well documented by the famous works of Nellie Bly in a reportage titled 'Ten Days in a Mad House'. Thankfully, her stunning work had an enormous (positive) impact on the asylum as it attracted almost a million dollars in funding to improve facilities and standards of care - a direct result of her scathing expose. Due to the reputation of the island as a haven for lunatics, many stories about the origins of the Roosevelt Island Lighthouse (Blackwell Island Light) were also inextricably tied to 'crazy narratives'. By one account, many thought that an inmate of the asylum singlehandedly constructed the lighthouse, whilst another said that there were cannons 'protecting' it. Obviously, these narratives failed to account for the fact that the gothic lighthouse was actually built by the city to prevent ships from crashing into the island whilst navigating the East River. The current community of Roosevelt Island has a population of about 11,500 people and most of its affairs are managed by the RIOC (Roosevelt Island Operation Corporation). This organisation also maintains the Roosevelt Island Sportspark and the various playgrounds for residents and out-of-island visitors. There is also the Roosevelt Island branch of the New York Public Library open to serve the island's inhabitants. The island is also predominantly a car-free zone (in line with the general mood of NYC) as the Q102 bus service provides a sufficiently high degree of mobility for the community. Interestingly enough, though the Queensboro Bridge does span the island to connect Manhattan and Queens, there isn't any proper means for cars to drive onto the island via the bridge. There was once an elevator that connected the Queensboro Bridge to the island, with commuters taking a trolley (from Queens/Manhattan) and stopping in the middle of the bridge for the elevator service. This service sadly was halted once the F train started serving the island. Its close proximity to Manhattan makes Roosevelt Island an excellent place to catch up on some exercise or to have a mid-day stroll. Expect cool breezes during the colder months of the year as the winds from the East River roll across the island. In the summer, Southpoint Park might be a good place to have a picnic. On the other end of the island from the Octagon and Blackwell Lighthouse, we find the Four Freedoms Park of Roosevelt Island - the definitive centrepiece of the island's modern identity. Built in 2012 under the vision of architect Louis Kahn, the FDR Four Freedoms Park sought to revitalise an otherwise ignored patch of land. But what about these four freedoms? FDR's four freedoms stood for the freedoms of Speech, to Worship, from Want, and from Fear; which he thought were the inalienable rights of anyone in the world. Through these freedoms, he expanded on what he thought America should stand and fight for - a global vision where democracy, freedom and economic opportunity would alleviate the plight of the oppressed. Apart from using the freedoms to rouse up public support for World War 2, they also were the first steps towards the creation of a truly global organisation that would promote human rights. This eventually lead to the creation of the United Nations (aptly just next to Roosevelt island), and the accompanying Declaration of Human Rights. 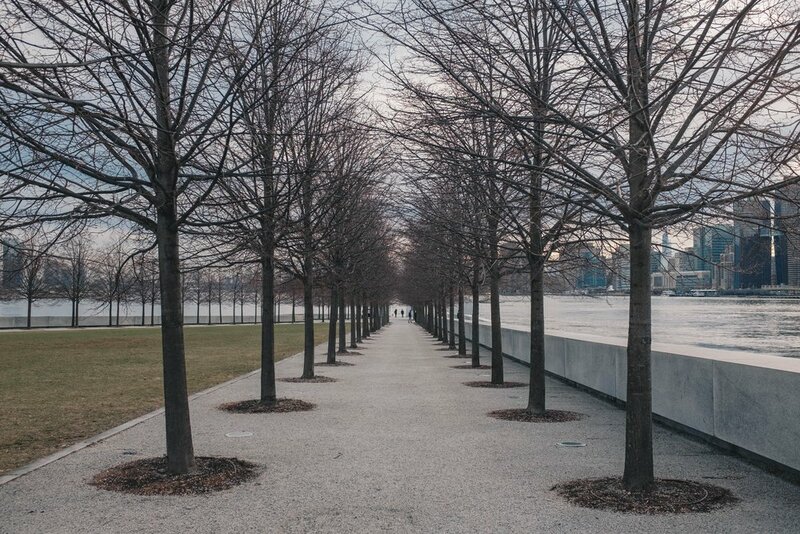 Due to its significance, visitors are advised to not treat the FDR Four Freedoms Park like a public park per se but more like a respectful monument to America's former president. As one of the New York City's most iconic architectural landmarks, we think that its perfectly aligned arbours and pathways shouldn't missed. Don't pass up on its beautiful linden trees either. Interestingly enough, the grandiose edifice of the FDR Four Freedoms Park sits face to face with the ruins of the Smallpox Hospital in a weird circumstance of juxtaposition as if to draw attention to the practices of the past and the revered aspirations of the future. The presence of the campus of Cornell Tech on Roosevelt Island also signals the island's departure from its much-maligned past. The campus now is a leading centre in computer science and engineering which is perhaps apt due for the technologically advanced campus. It is after all, a leader in environmentally conscious design. Getting to the Island is pretty easy, either hop onto the Roosevelt Aerial Tram in the Upper East Side (which will whisk you over the East River) or take the F train from stations in Queens or Manhattan as there is no dedicated Roosevelt Island subway line. Though driving to the island is pretty easy, the only accessible roadways are through the Roosevelt Island Bridge in Queens. If you do want to walk over the river and onto the island, this bridge is your only option as well. However, we think that you should just take the subway or the tram - both services have the same fares. You can check out the Roosevelt Island Tram's schedule and hours of operation here. We hope that you'll pay a visit to Roosevelt Island the next time you're in New York City - our visit certainly didn't disappoint us. In case you need some help, the Roosevelt Island Historical Society has been hard at work preserving the beauty and history of the island. They also operate an extremely useful visitor's centre where you can find maps and further information about the island's attractions. Love what you're reading? Follow us on Facebook to keep up with articles on all things travel.